Meade Series 5000 HD-60 LE Eyepieces 1.25"
The latest advancement in the Meade Series 5000 eyepiece series offers a large 60° apparent field of view and a flat field of view which is tack sharp right to the edge. This design provides more than 17mm of eye relief for terrific viewing comfort while simultaneously delivering a 40% improvement in corrections for chromatic aberration and edge distortions over traditional Plössls. You simply won't believe how much a premium eyepiece can improve your view, no matter what telescope you own. Meade Series 5000 Plössl Eyepieces offer a very wide field-of-view, with pinpoint edge of field sharpness and contrast. Specifications of this advanced design include a six element, super fully multi-coated optical design with premium-grade and exotic optical glass for the best possible performance and image brightness and blackened lens edges for enhanced contrast. 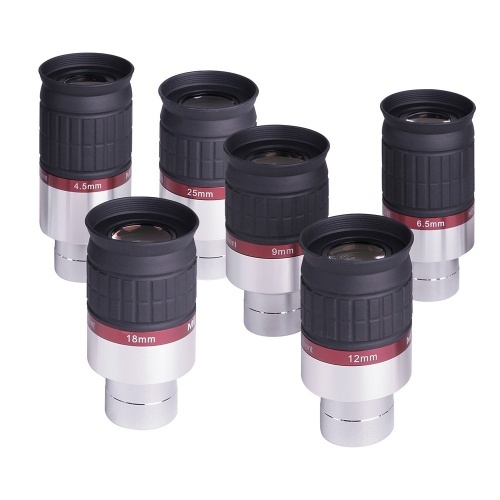 This range may be all the eyepieces an observer may ever require, including six quality eyepieces from low to high power with focal lengths of 4.5mm, 6.5mm, 9mm, 12mm, 18mm and 25mm. Each eyepiece features a precision manufactured 1.25" barrel, increased eye relief and an adjustable twist-up rubber eyeguard for comfort and blocking stray light. Take a look through a Series 5000 Plössl Eyepiece and rediscover your favorite celestial objects. Celestron X-Cel LX x3 Barlow Lens 1.25"